Pearl Harbor Widows have gone into war work to carry on the fight with a personal vengeance. 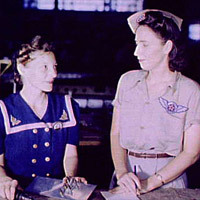 Mrs. Virginia Young (right) whose husband was one of the first casualties of World War II, is a supervisor in the Assembly and Repairs Department of the Naval Air Base. Her job is to find convenient and comfortable living quarters for women workers from out of the state, like Ethel Mann, who operates an electric drill. This is the original caption for this Office of War Information (OWI) photograph. Can you see how it would attract people to the war effort?